The Entertainment Capital of the World, Las Vegas, is famous for its hotel casinos. The massive hotels have thousands of rooms with facilities for gambling, shopping, entertainment and dining. But for an artist the dazzling and classy interiors of the hotels are the attraction. The highly maintained hotels have expensive interior decoration. 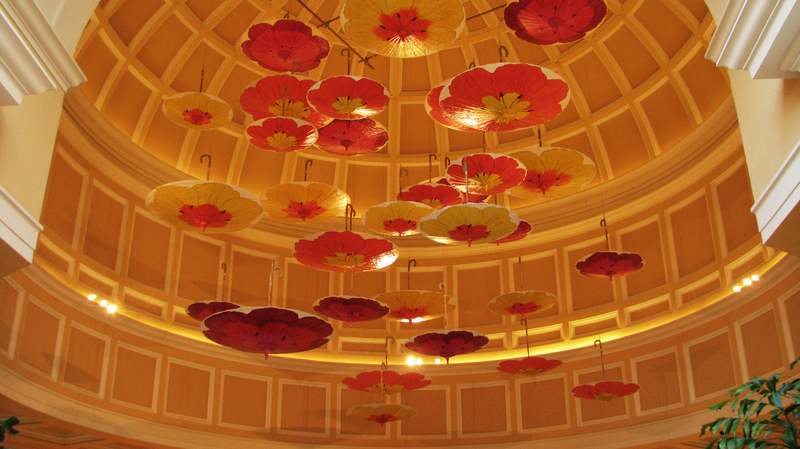 I found this ceiling to be the most fascinating because of the idea, colors and the lighting. These are the umbrellas that we would probably use on a rainy or a snowy day to protect ourselves. Can we imagine them to be part of a billion dollars hotel? The beautiful concepts of the interior decorator make all the difference. The orange, red, yellow and white colors give it an appealing look. The upside down umbrellas looked like inverted mushrooms. The dome shaped ceiling with the hanging umbrellas stretched to a very lower height highlights them from a great distance making the hall look royal. The picture is qlikd in the Personal mode with neutral lights. Since the picture was qlikd in the morning time, high brightness faded its impact. The photograph had to be edited for its contrast using Strong Contrast option from the Curves preset. Pic is good, however at few places (specially on umbrellas) the pic the over exposed and details are missing. Try to click such pictures with shutter priority mode and low ISO. yeah u r right.. i tried hard but cud not get it.. will try your options next time.. thanks! !